The Leader in Me Process for Local Schools Receives Largest Single Gift - OneMacon! 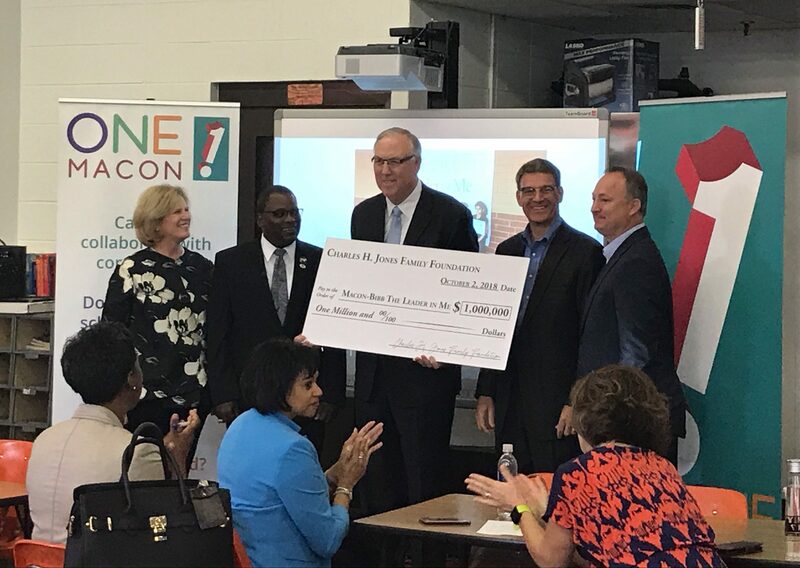 Macon, Ga. — The Charles H. Jones Foundation has granted a $1 million gift to the ongoing implementation of The Leader in Me, which will allow the character-driven leadership process to expand to every elementary and middle school in the Bibb County School District. Blake Sullivan, co-chair of the Business Education Partnership, announced at today’s OneMacon Steering Committee meeting that this is the largest single donation toward The Leader in Me’s implementation since fundraising began in March 2017. This donation now brings the combined gifts from private donors to $2.4 million to implement The Leader in our elementary and middle schools. Additional funds are being raised to complete the funding for The Leader in Me in our high schools. The Charles H. Jones Family Foundation, named in honor of Dwight Jones’ father, has donated significant resources to projects in Macon, Central Georgia and across the United States. The Leader in Me process is based on best-in-class content and concepts practiced by education thought-leaders. Guided by Steven Covey’s The 7 Habits of Highly Effective People, The Leader in Me is a whole-child, paradigm-shifting process that teaches enduring values and principles that students can use throughout their lives – in and outside the classroom – preparing them for post-graduate education and beyond. Currently, the Bibb County School District has 21 elementary, middle and high schools engaged in The Leader in Me process. In August 2018, Southwest High School became the first high school in the Bibb County School District and the state of Georgia to engage in the leadership skills of The Leader in Me, using these skills to help become college, career and workforce ready. Now, the Business Education Partnership, a collaborative group of local business leaders working with the Bibb County School District, is expanding its original fundraising goal in order to incorporate The Leader in Me in all six Bibb County high schools in the next few years. The Jones Family Foundation was founded by Charles H. Jones in 1986 for the purpose of giving back to the communities wherein he garnered success. We exist to provide grants to qualified 501(c)3 organizations in Middle Georgia that provide high impact results focused on improving the overall community in education, religious, and civic endeavors. Learn more at thejonesfamilyfoundation.org. OneMacon is an alliance of more than 40 private, public and nonprofit organizations making a positive economic impact on the region using a community and economic strategy based on three pillars: schools, jobs and places. This collaborative initiative supports and enhances the efforts of Macon-Bibb organizations and community members, united in creating an energetic and opportune region where workforce thrives, sense of places is keen and education excels opportunity. Read more at onemacon.org. In response to strategic recommendation 1.1 to be pursued by the OneMacon Implementation Committee, the Macon-Bibb Chamber of Commerce and the business community formed a collaborative partnership, the Business Education Partnership (BEP) with the Bibb County School District. One of the first successes this partnership implemented was The Leader in Me, where in 2015-2016, the community provided funds to implement the process in two schools. After seeing the results – a positive impact on not only the students, but also with the teachers and parents – the partnership continues to raise private funding so that every school in the Bibb County School District incorporates The Leader in Me process within the next few years.